I have uploaded primary basic reading videos of Telugu language from Class 1 textbook in my previous post. In this post, I am uploading the advance learning videos from the 2nd-grade textbook. I am uploading eight lessons videos in this post. In these, you can get Guninthalu Revision and OTTULU Introduction videos. ట్ట (ITTA), ల్ల (ILLA), న్న (INNA), ర్ర (IRRA), ప్ప (IPPA), ద్ద (IDDA)ఒత్తుల దిత్వాక్షర పదాలు -OTTULU words and Guninthala Revision (గుణింతాల పునశ్చరణ) videos are available in this post. Academic Standard: Grammar and Speaking Topic: Positive vs Comparative, Grade: 3rd. Teaching grammar to primary school children is somewhat difficult. We cannot teach grammar isolate since their cognitive levels are not that much to understand the grammar topics. So we need keen on teaching grammar for primary school children. We always teach the grammar for the primary children in the situational base. Later they understand the basic structure and feature of the topic and use in their communication. These are the second part of the videos to learn Guninthalu easy and effectively. In these videos, I introduced five OTTULU ( ఒత్తులు ), " ు, ూ, ె, ే, ై " for all the letters. You can download and practice with your children in your classroom. These videos will help to engage the class and give an effective learning environment in the classroom. And you can download related worksheets to practice writing after these OTTULU. It is effective material than charts and flash cards because nowadays children are easily attracting to technology and learn their self. Such content also retains in their brain than other things. So using technology and such video in our teaching leads to attaining targeted academic skills among the children. So I hope you download the videos and use in your classroom for better learning of your children. I prepared these videos to practice and learn the TELUGU GUNINTHALU - తెలుగు గుణింతాలు for beginners and slow learners. I have posted Telugu reading videos in my previous posts. After learning those words, we introduce the pattern of Telugu Akshamala. Those practicing videos also posted in my previous post. 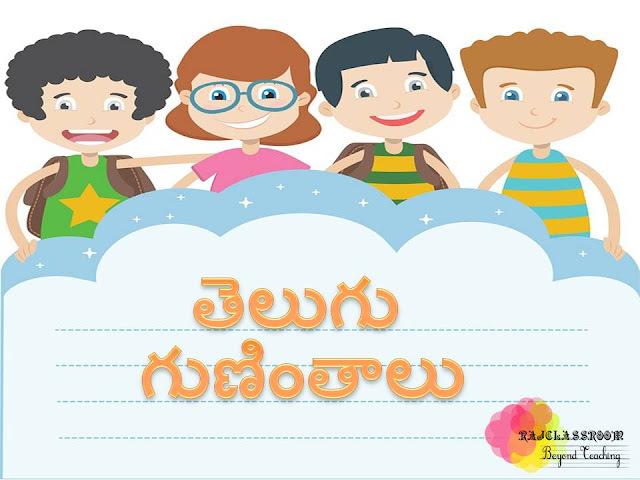 Once children have learned and identified the simple words ( సరళ పదాలు ) and Aksharalu ( అక్షరాలు ) we start Guninthalu ( గుణింతాలు). I have introduced four letters and a few OTTULU only in each video as per the learning style and cognitive level of the low-performance children. Because they cannot learn the whole GUNINTHAM in a single attempt and learning will be a burden to them. It leads to disinterest to learn the Gunitham and backwardness in the subject and skills. Here I prepared two videos to practice the Telugu alphabet and recognize the letters in a random way. Especially these videos help the teachers to create interest among the children and reduce the work burden and children for self-learning. Thought these are regular videos it will help the teachers to learn the alphabet for Dyslexia and low-performance children. Because of the new way of teaching the TELUGU language is changed from "Letter to the Word" to "Word to the Letter" since learning happens known to unknown. So once you taught the words then you need to introduce the alphabet in the particular word. So in this word based teaching, you need to practice the alphabet separately between the periods. So these videos may help your children to learn and memorize the alphabet better than traditional teaching. I have prepared these videos especially to develop the language skills of low-performance children. The Dyslexia children in my class showing great interest when teaching use these videos. And normal children are more interesting and learning also increasing very rapidly while using these videos. This teaching method also got published by the British Council and Center Square foundation jointly as one of the best top 20 teaching Methods in India for the year 2017 in the magazine " Teaching With The Technology - Case studies from India."